This post is part two of a two part Sensationalist series exploring how games use death to evoke emotions. WARNING: This post may contain major spoilers for Final Fantasy VII, Far Cry 2, Half-Life 2: Episode 2, The Darkness and Lost Odyssey. Last week I discussed the death of player characters in games. This week my focus is on non-playable-character death. I'm honing in further to just NPCs who are close to the lead character. I'm intentionally excluding the deaths of random background individuals and enemies, including boss figures - all worthy of study on their own. To draw from Ernest Adam, as I did last week, the death of an "other" is unique. We mourn their loss differently because we have no control over their fate. Unlike the player's death, we are not to blame for their passing. In some ways, this makes their death more significant. 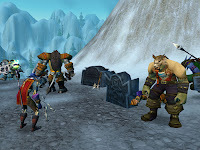 In Adams's opinion, "to make death meaningful in a computer game, it is not the player who must die, but the player's friends." I know we have all been through this before, but I have to do it. 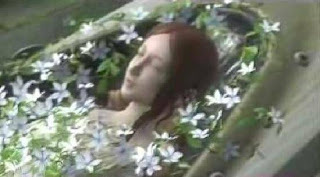 The death of Aerith Gainsborough (or Aeris pre-retcon) in Final Fantasy VII is, hands down, the most significant death in gaming history. For many gamers, her death is their most memorable gaming moment. Numerous fan fiction has been written about her, stories have brought her back from the dead, and rumors have spread about ways to resurrect her in-game. There was also a petition signed by Japanese players urging Final Fantasy VII Director and Story Writer Yoshinori Kitase to bring her back to life, to which he refused. "People die of disease and accident. Death comes suddenly and there is no notion of good or bad. It leaves, not a dramatic feeling, but great emptiness. When you lose someone you loved very much, you feel this big empty space and think, 'If I had known this was coming, I would have done things differently.' These are the feelings I wanted to arouse in the players with Aerith's death relatively early in the game. Feelings of reality and not Hollywood." Unlike the noble death of player characters, NPCs die as unaware innocents. Although her death is technically a sacrifice, her sudden death is effective because she is a love interest who represents an exaggerated feminine embodiment of good. Her healing abilities are hospitable by nature, her pink dress and timid demeanor hides a woman of conviction, and of all people, Cloud is her true love. To kill this character, a crucial element of the player's party, reminds the player what is at risk. 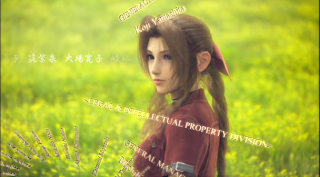 In an excellent article comparing Aerith and Yuna, Denis Farr of Vorpal Bunny Ranch and GayGamer points out: "The trope that still remains strong is the romantic bond both plots place between this male/female duo, and the expectation that part of what we are mourning is the loss of a future together. " For many, Final Fantasy VII was the first game to permanently kill a meaningful character and transform a classic RPG narrative story into a vengeance tale. The utilitarian argument is raised too often when citing how FFVII successfully evokes emotion with Aerith's death. 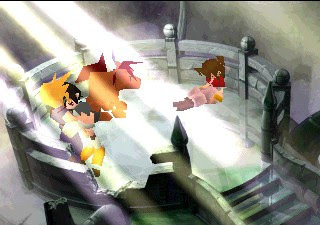 Some suggest Aerith's death evokes more anger than sadness by kiling off a valuable party member in which the player has invested time. While the ability to level Aerith does hide her inevitable demise, the loss of time investment does not evoke anything but anger in pursuit of the self-interested player. If this were the case, numerous games would succeed with even temporary character restriction, be they death attributed or not. 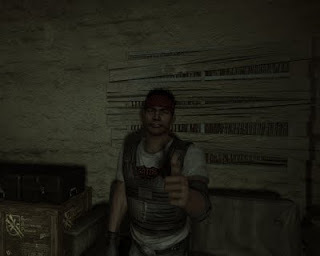 Far Cry 2 succeeds with their NPC death by exploiting the players dependence on utilitarian benefits. The player in Far Cry relies on NPC allies to revive them, and these allies rely on the player to do the same. This mutual trust, at first, builds a sort of friendship. Unlike Adams's suggestion I mentioned earlier, whether an ally lives or dies is ultimately in the player's hands. An ally's early death is avoidable and therefore meaningful in a different way. This relationship changes however. Allies begin to mix with one another. Their motivations are increasingly selfish, and they begin to represent a foreign breed of the native combatants. Before long, the death of an ally becomes less meaningful than those last few syrettes. After all, another mercenary can easily take their place. When the player kills a dying ally themselves, without hesitation, Far Cry 2 succeeds in creating a unique death that evokes what the lead character feels: nothing but cold self-interest. Death is nothing without a period of mourning. How we each say goodbye to those we have lost is both a personal and shared experience, and a fascinating cultural creation. Western bereavement practices, for example, are relatively brief and distancing affairs. In the final moments, it seems, we are scared of what death entails for the living. Then perhaps it is no surprise mourning is largely absent from videogames. The few exceptions to this rule, many of which are brief depictions of loss, tend also to be the most moving. The death of Eli Vance in Half-Life 2: Episode 2 is a powerfully somber moment. The perpetually silent Gordon Freeman is incapable of ordering fast food let alone mourning, but Alyx is not. Eli's daughter, who seems to speak for Gordon on numerous occasions, mourns in his stead. Her repeated cries of frustration and anguish, her final "I love you" to her father, the way she runs to his limp body, and her tears echoing in the darkness before the credits, are powerfully moving because they realistically depict the immediate sense of loss following the death of a loved one. The final credits immediately following allow the player to linger on this moment, giving them a time to mourn Eli's death on their own. The Darkness depicts a similar moment of immediate loss when Jackie's girlfriend Jenny is murdered in front of him. Like Alyx and Gordon, Jackie must watch helpless while this happens. His grief overcomes the darkness possessing his body, and Jackie kills himself. His suicide and time in the underworld depict immense grief, an emotion strangely absent from NPC deaths in most games. 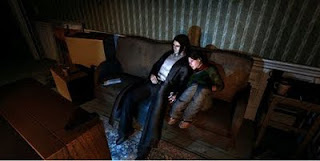 His final moments with Jenny at the game's conclusion evoke loss and regret because they dwell on her death, and Jackie's regret. Like Half-Life, these emotions are with the player the moment the credits roll. Above and beyond these examples is Lost Odyssey. Kaim, the lead character in the game, finds his daughter (whom he presumed dead) on her deathbed due to illness. Her death is not sudden and not the result of an evil wizard or dark fate. Her body is not quietly and quickly disposed of, but decorated and sent off to sea with a lavish funeral. In fact, the player is actively engaged in the ritual, tasked with collecting flowers and participating in a torch ceremony. Her two children, Kaim's grandchildren, mourn with Kaim and discuss the death of their mother openly. Lost Odyssey evokes a sense of loss by embracing death and grief and including the player in the process. Most of us know these feelings far too well. Giving us a venue to join in the mourning process with the game's cast is a bold and successful strategy. There are few more games that give death its proper emotional space. The Graveyard, again, is a meditation on loss and mourning itself. Lucidity, LucasArts's latest, seems to approach mourning through the eyes of a young girl. Dungeons & Dragons, amongst other tabletop games, has long given a space for players to mourn the death of their companions in interesting ways. However, death is widely passed over by players and lead characters alike. Death usually serves to highlight danger or motivate the lead character with a vengeance imperative. Mass Effect, Red Faction: Guerilla, Fallout 3, among others, leave the mourning process to the real world, where we seem to hide just the same. As Kitase says, losing a loved one "leaves a great emptiness." Games should have the courage to sit in this somber place a little longer. I find your two big JRPG mentions fascinating, quite possibly because I dislike JRPGs and both examples serve well in my discourse of the emotional dissonance in JRPGs. I guess the obvious point is that we all have different emotional reactions and that JRPGs don't work for me in terms of emotional involvement. Story death trumping gameplay death has been a contentious issue in JRPGs over a decade. Ironically, one of the first games to utilize story-based character death, Final Fantasy 4, also went to great pains to rationalize it within the logic of magical abilities available to your characters. Characters cast Cure spells when a comrade is wounded in combat, so there's a scene where a character casts Cure on a wounded friend in a story segment. There's one section where special magic permanently turns two characters to stone, and because of its special nature anti-stone spells and items fail. It's all pretty ad hoc "there's something special about this situation" stuff, and most of the characters are miraculously healed at the end. But it's the simple fact they they at least made an attempt to explain why you don't just use a phoenix down that makes it that much more believable. The Final Fantasy games in particular make sure to say that characters taken out of commission in battle are merely "KO'd" or "swooned" not "dead," but this terminology is used elsewhere to denote that fallen characters aren't technically dying. This means that you're not resurrecting them per se, just waking them up. How exactly they manage to merely pass out after you crash a meteor into their cranium is a secondary concern. This is all relies on some fine semantic distinctions, but for somebody who earnestly enjoys the statistic-management nature of turn-based RPGs it enough to allow me to suspend my disbelief so long as the characters are fairly well realized and the story well written. Your dislike of JRPGs brings up a point I didn't mention in the article. I guess it's taken for granted, but you can't have a meaningful death if the dying character is not meaningful in life. The general RPG dissonance can bring down any sentimentality for a character. Which is to say, when an RPG succeeds, or at least is daring, you can't help but imagine how it might be pulled off even better. I love the rational behind story death, and Final Fantasy 4 does a great job of it. But it also pulls so many punches. It feels like all the early Final Fantasies had a character die, and then miraculously reappear later in the game. I think they rely on the noble-death-fake-out I mentioned last week, maybe because they are playable characters. I think the segregation of gameplay and cutscenes really grates in these JRPGs- if you've spent all your time up to that point trying to keep Aerith alive, only to have the game kill her in the cutscene, you're going to be less tearstruck and more annoyed. I remember being very put out the first time through the Lost Odyssey example, because I felt that I *didn't* know the character yet. The game was trying to make me feel for a character I never knew, and I resented that, a bit. I think it works better, like you say, to consider the death as a lost potential, that Kaim lost a part of his past just as he found it again. It also works to cement the children as characters--it's very rare for a game, even games that abstract combat like a turn-based RPG--to let you lead children into battle, or include them as PCs at all, and the scene did a lot of work in establishing why these two matter.